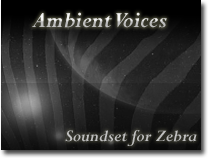 Ambient Voices is a freeware collection of 100 atmospheric patches with a layered moving sound for u-he Zebra. The soundset includes expressive ambient soundscapes, complex FX, rich and evolving pads and rhythmic atmospheric sounds. Most of patches have assigned XY controls. Additionally, some patches combines a fixed frequency sound generation with a traditional tune scaling. This helps Zebra to synthesize sounds with an extra key-dependent timbre. No automation or external FX used, except master soft limiter.